In the evacuation of the political space, the religious rears its head. This, in short, is the central problem that drives Etienne Balibar’s excellent new book Secularism and Cosmopolitanism, the text offering a range of brilliant analyses that not only deepen our understanding of the problematics of religion within contemporary society, but also how secularism is in vital need of theoretical and conceptual reform. In the book, Balibar attempts to found ‘a new critique of religion’ which stretches the very concept of the religious beyond religion into the secular domain (p.viii). What does this mean? It means that contemporary society through ritualistic behaviours and sacralised conceptions of the State, of citizenship, and of economic exchange, has become invested with a quasi-religious quality. Liberal-secularism is unable to relate to itself critically, principally because it has become its own form of religion; ritualised in practises such as voting or monetary exchange, and dominated by transcendental themes such as the immutable power of the citizen and their rights (the case of Israel today representing something of parody under this criteria). Balibar, like his mentor Althusser, seeks to ensure that god has nowhere to hide (See Althusser; 1970), that critique must be up to the task of transformation and that a revitalised secularism works hand in hand with a cosmopolitical project for democratic renewal. It is here that Balibar uses the language of heresy, this constituting a form of speech or action which questions religious sensibilities, drawing attention to contradictions, the pervasiveness of power, and thus providing an alternative vision or realm of possibility. Reforming secularism so that it can adequately mediate between entrenched anthropological differences requires us as citizens to engage in heretical debates in the public domain, challenging the presuppositions that ground public life, thus turning the criticisms we often level at other religious societies towards our own. This book therefore provides a vital contribution to the literature on secularism and offers a novel reading of the mimetic relationship that defines religious and secular encounters. The book itself is split into three parts, its composition derived from separate texts which have been revised, the first originally published in France (Saeculum: Culture, Religion, Idéologie 2012), the second part consisting of three essays which had been published prior to Saeculum: Note on the origin and uses of the word “Monotheism” (2006), God Will Not Remain Silent (2009): Zionism, Messianism, and Nationalism, and What Future for Laïcité? (2005). The third section comprises of three much smaller statements published elsewhere as popular articles, providing a good conclusionary supplement to the text. Each section compliments one another and can be read non-chronologically. 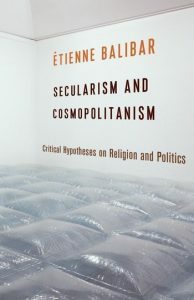 Although Balibar makes regular reference to the French situation, and the particularities of Laïcité (secularity), the book’s themes have broader relevance and are likely to be of great interest to those on the left who seek to navigate the problematic terrains of religion, culture, and the recurring issue of what it is to be a citizen. Without further ado, let’s begin with the problem of the universal. In Balibar’s formulation, the pressing problem of our conjuncture is that of a ‘conflict of universalities’ which often seem to only be able to communicate their differences through conflict, or violence (p.59). In Western democracies, through the liberal-secular paradigm of public and private, this conflict takes on a deeper dimension, forcing religious minorities (the Jewish diaspora historically, the Muslim community contemporarily) to enter into a state of ‘homo-duplex’ (p.58), their identities being caught between the civic and the religious. However, as Balibar also acknowledges, our cosmopolitical world is transnational in nature (even if we are resistant to it) and this comes with differing dynamics: ‘the relativization of borders, the hybridization of cultures, and the migrations of populations’ (p.viii) which means that ‘no truly secularized democratic politics that is socially and culturally progressive is tenable short of cosmopolitanism’ (p.7). The religious as they exist today are thus caught between the demands of their community, and the demands of the community they have either willing adjoined, or in the context of recent conflicts and historical displacements, found themselves forced into. It is worth noting, as Balibar does, the divergent but interconnected relationship between religion and culture. In the religious mode ‘one converts, individually or collectively, to a creed, acknowledges the authority of the law or the truth of a dogma, chooses a road to salvation, serves a god or even a name, and becomes the adept of a ritual’, whereas ‘one can only adapt a culture or, more or less easily, adapt to its forms of life, because they do not invest the body and affect the unconscious the same way’ (p.36-7). And thus, we can infer that religion implies community ‘confronting the universality of the world (or the truth)’ and this diverges from the cultural mode which is particularistic in nature (p.37). Religions have historically been able to travel expansively, whilst cultures often remained relatively static. However, the transnational character of global society and economy, its cosmopolitcal transformation, has subsequently problematised the fixity of religion and culture within a territorial totality. With globalisation, what occurs is the becoming-cultural of religion, and the becoming-religious of culture as populations merge and hybridize. Ritual meets the abstract practises of culture, and subsequently both become invested or determined by one another, this process being both constructive and destructive. Historically we can perhaps use the various imperial expansions as case studies of quasi-globalisation, their legacies being riven with cultural and religious tension. The religious subject may be inclined towards retreat or acceptance of our present reality, but nonetheless in the case of European polities, the subject must also confront the determinations of citizenship. Balibar’s examination of laïcité and its relationship to citizenship provides an important intervention in this regard. For Balibar, laïcité is caught between two traditions of Catholicism and republicanism, and their respective enlightenment counterparts: Hobbes and Locke. The first tendency inscribes the state with the power to represent the best interests of the multitude and is thus statist or authoritarian in nature, whilst the second tendency is inclined towards toleration and libertarianism (p.163). With the first, the public interest takes priority, whilst in the latter, the private is the priority. Balibar argues that in the French context, laïcité has mutated into a form of ‘Identitarian Laïcité’ which implies ‘the identity of the Republic… resides in laïcité, and, correlatively, that laïcité must serve the assimilation of populations of foreign origin… lest they are liable, by their culture and religious beliefs, to constitute a “foreign body” at the heart of the nation’ (p.164). This then leads us to the mimetic rivalry between secularism and the religious, both mirroring one another, the sacred penetrating into the secular domain. As Balibar states, laïcité has produced ‘the sacralization of the Nation as a quasi-divine, transhistorical entity’ (p.119) and consequently laïcité attempts to partially neutralise politics (in the Schmittian sense of antagonism between enemies) by regulating ‘legitimate political competition’ as opposed to ‘illegitimate political antagonism’ (p.123). This is where heresy becomes important as a tool against dogmatism, but we shall return to that later. Another crucial dimension to Balibar’s thesis is the dimension of the untranslatable, which in this case makes itself manifest most explicitly in the conflictual ways in which Islamic (and by extension Judaic) universalism and secular (Christianised) universalism engage with one another. Both lack the language necessary to fully articulate a sense of understanding with one another, their divergent histories, eschatological heritages, and etymological differences rendering positive exchanges difficult, especially when power relations and legacies of violence enter the mix. Recognising the precarious dimensions of language goes against Ulrich Beck’s optimism in the possibilities of globalisation to foster an upgraded ‘dialogic imagination’ which would allow for global issues to become translated into local units of concern (2006; p.89). Consequently, Balibar’s essay ‘Note on the origin and uses of the word “Monotheism”’ (p.69) is particularly insightful by illustrating how at the very level of language, Christianity and secularism evolved syncretically, borrowing from one another to develop practises, rituals, and institutions. Monotheism and by extension the religious are etymologically Roman and Christian; through the very use of such terms we subsequently produce a ‘romanization of the world’ (p.27). Why is this important? Well because if we draw on the lessons of deconstructive thought and Edward Said’s insights into Orientalism, we can understand that language imposes a power relation upon the subject, it influences how we engage in the world. We must ensure the subaltern can speak (p.151), that the language used is not just ours but also theirs, or better yet we should invent a new language (of mutual comportment rather than homogeneity). Put in other words, we need to reconfigure ‘regimes of translation’ to render ourselves as subjects that can relate (p.32). Considering the predicament, we are in at a global level, such a call for a new language has a great deal of efficacy and will likely be required if we are to act in common. We are thus struck by the prevalent theme of a clash of civilisations, the recurring problematic of the privileging of one civilisation over another, of their tendency to impose rigid borders, to shelter behind them in the name of purity. The conflict between universalisms produces a process of mimetic intensification; sacralization concretising core tenets which otherwise would be open to reform. Take for instance the bodily regimes (p.xxxii) of western societies, which may purport to liberation, but end up always inscribing a prescriptive narrative of what ought to be the way women must act or dress. Balibar’s insights into debates surrounding the banning of the veil in France are incredibly helpful and clear in this regard, as he says: ‘female subjects found themselves caught between the battle lines and strategies of two groups that can be both described as phallocratic… and that have made the regulation of women’s bodies the battlefield and stakes of their will to power or a defence of their hegemony’ (p.17). Banning the veil imposes a double-bind upon veil wearing Muslim women, it forces them to make a decision: participate in public life and forgo one’s cultural autonomy, or, remain relegated to the private sphere and thus preserve one’s cultural identity. Both inhibit freedom, and both impose a regulatory decision upon women who cease to have a say over how they articulate their identity and their autonomy. Balibar suggests thus we must heretically criticise existing universalisms (religion, capitalism, secularism, etc) and begin to construct a Vanishing Mediator that takes the form of a ‘secularism secularized’ which also implies ‘de-stated’, ‘de-Christianised’, ‘demasculinised’ (p.60). Such a secularism embodies the heretical dispositions of Spinoza (See Spinoza; 2007) and the anti-teleological arguments of Derrida (See Derrida; 2001), and as Balibar argues ‘it might be called, rather, declarative or performative, in the sense to begin with, that it effects its own free statement of truth… in the face of discourses of power based on myth, revelation, or the force of habit, but also in the face of the authority of science and the law’ (p.56). Balibar is thus not prescriptive, he does not set a policy framework from which we can readily replace our existing secular institutions, but he does provide us with an essential analysis of our contemporary predicament and the nature of the beast which has deepened rather than undermined the development of conflict in our societies. This book is therefore a vital read, both challenging and probing, and one which we can all benefit from. Beck U 2006 Cosmopolitan Vision Cambridge: Polity Press.